During the first day of Senate Hearings on the Anti-Fortune Telling Bill, the big revelation was the members of Congress and their wives often visited and consulted with the mediums and fortune tellers. It was brought up that even the White House was known to consult these folks. Here was information I'm sure the D.C. class didn't want to get out, but it did. I wonder if that's why the second day of hearings wasn't until the end of May, because they were hoping people would forget. On May 18th, 1926 the Congressional Hearings for HR8989 the Anti-Fortune Bill resumed. The hearings began by hearing testimony from Remegius Weiss of Philadelphia. Weiss, no relation to Houdini's family, was an investigator into mediums and spirit phenomenon. He was another of the many investigators working for/or with Houdini. Weiss shared how he had exposed the famed Henry Slade, and even got Slade to sign a confession. The name of Conan Doyle also came up during the testimony and the Congressman were under the belief that Conan Doyle was a great authority on Spiritualism. Moments later, Houdini addresses the Congressman in regards to Doyle. Mr. McLeod again reiterates that Conan Doyle was an authority on Spiritualism. Houdini jumps in and says, "Conan Doyle is not an outstanding authority." McLeod responds, "He is accepted as one of the best." And Houdini follows, "No, he is not accepted as one of the best. He is one of the greatest dupes, outside of Sir Oliver Lodge. Conan Doyle stated I posses mediumistic powers, which I deny." McLeod says, "How can you prove it?" Houdini replied, "I admit that I do not have mediumistic powers. They claim in a London psychic college I dematerialize my body, and that I ooze through and come out again and put myself together." Mr. McLeod follows with, "How do you do it?" Houdini says something which is quite remarkable, "I do it like anybody else would do it. There is nothing secret about it. We are all humans. Nobody is supernormal. We are all born alike." Then Congressman Bloom, one of the resolutions authors, says, "Have you ever heard of another city in the United States that has a similar law to the one in the District of Columbia in regards to fortune telling?" Houdini then explains that no city gives such a cheap license to fortune tellers and in fact, most cities actually have laws prohibiting it. Of those cities that do offer a license, they have fees like, $1500 per year, $1000 per year, $5 per day, $500 per quarter and $150 per month. Whereas the District of Columbia charges a mere $25 per year. Next to testify would be Rose Mackenberg. She would again open up that source of embarrassment for quite a few Congressmen which was first revealed in February. Rose had visited two of the key mediums in the audience, Madam Marcia and Rev Jane Coates, prior to the days proceedings. She visited them separately, but a key bit of information was shared by both mediums. That devastating bit of information was that Congressman often visit mediums in town. Not only that, they included the White House among their group of spiritualism devotees. And then, she mentions that Senator Fletcher's wife is a medium herself. This revelation also includes the clue to a question I have had for a while. That question is, "how did all these mediums and fortune tellers know about the hearings in order to show up?" Well, along with the fact that many Congressmen attend seances or get readings, Rev Jane Coates also mentions that she has been lobbying Congressman and had interviewed 22 of them and 16 were 'entirely favorable towards spiritualism'. Obviously, with members of Congress being so friendly with the spiritualist community, it's easy to see who told the mediums about the hearings, the Congressmen! Reading Rose Mackenberg's testimony is certainly fascinating, but I'd like to share with you now, testimony from 'the other side'. No, not from the spirits, lol, but rather from one of the spiritualists. On May 20th, 1926, Reverend H.P. Strack, secretary of the Nationals Spiritualists Association of America, gives his testimony. What he tries to do is shred the statements made by previous speakers. He began with Remegius Weiss's testimony about Dr. Henry Slade. Reverand Strack says, "In the testimony given by the man from Philadelphia (Weiss), he refers to a seance conducted by the medium named Slade. If the committee will remember, in this man's testimony he stated the medium would take his foot and kick a book, and the book would remain floating in the air. That is concrete evidence of mediumship, the law of levitation forcing a book to remain in the air that has been kicked by a medium." Now, let's look at what Weiss really said. "A book extended over the edge of the table, Dr. Slade slyly gave the book a kick with his left foot from under the table. The book turned over like a flap door. There is nothing remarkable in this trick. Still up to this time, spiritists say 'Dr. Slade floated a book in the air.'" So, Weiss actually showed that Slade's attempt to 'float a book' was actually done by secretly kicking the book. And that it merely flipped over. It did not float in the air. And despite this, the spiritists claim the book floated, NOT Weiss, who again, exposed it. So Reverend Strack was misleading in this part of his testimony. mentioned that Houdini claimed that all of these mediums were fakes and frauds and asked if he would include the Davenport Brothers in that statement. 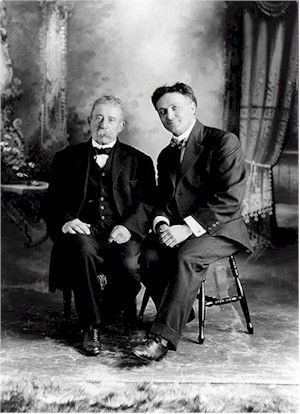 Houdini apparently replied, "The reason I have not included the Davenport brothers was because they are personal friends of mine, and I am a student of Dana Davenport." I haven't been able to check this against the actual record, but it's fairly obvious that Houdini simply didn't want to include his friends in all this nonsense. The Davenports never claimed to be real mediums, but they also never claimed that they weren't. Houdini said the Davenports shared their secret rope tie with him. At this point though, they were no longer performing. I'm not sure who Dana Davenport is though, as it wasn't the name of either of the brothers. Perhaps it's a misspelling or the stenographer didn't take down the name properly. The brothers were William Henry and Ira Erastus. The photo to the right is of Houdini and Ira Erastus Davenport. The other brother had died back in 1877 when Houdini was just a child. A curious moment happens when President Abraham Lincoln's name is brought up. Lincoln seems to be a favorite 'spirit' among mediums as he has a habit of showing up in many so-called seances. The spiritualists communities often point to Lincoln himself being a devote spiritualist. Houdini at one point decided to squelch this statement by bringing for into evidence a letter, written by Lincoln's son, denying that his father was ever a believer in spiritualism. Mary Todd Lincoln was the one so desperate as to seek out these folks, but not Abraham Lincoln. Some of the additional highlights from the proceedings include Houdini giving a demonstration of spirit voices speaking through a trumpet, which was well received by the congressman. A bit later, one congressman mentions a stunt that Houdini did where he was blindfolded and drove around town, and he would stop the vehicle and retrieve a missing object. At first this seemed to me like a blindfold drive, but now I think it's probably more akin to a mere blindfold stunt or at the most some sort of hellstromism (muscle reading). At a later point in the proceedings Houdini gives a demonstration of Slate Writing, which he prefaces that 'anyone can do'. In other words, it's not supernatural. He shows two school slates, and the numbers 1-2-3-4 are written on the respective sides of the slates to show that they contain no other writing. Then the numbers are cleaned off and the two slates tied together with a handkerchief and placed a piece of chalk between them. 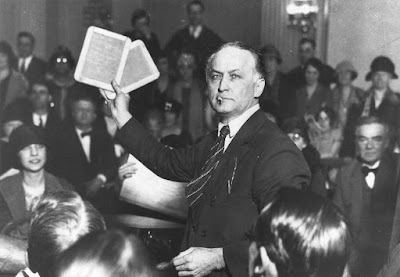 Next, Houdini produces a dictionary that was purchased that morning and asks a member of Congress to drop a card within the pages of the book, so marking a page. He comically asks the Spirits to tell him the number of the page, the first word in the book and some sentence that he would not know. Sure enough, when he unties the slates, writing is seen, the page number is correct, the words are correct, and there is a sentence which is actually a message for someone in the room. Oh, but there was one more thing. Madame Marcia, whom Houdini called Madame Marchia, and it was recorded that way in several publications. Madame Marcia made a prediction that Houdini would soon die. She wasn't the only medium to predict that, or wish that. And in this instance, that prediction would ultimately come true. In the end, despite 4 days of testimony from Houdini, his investigators, Madame Marcia, Reverend Coates and others, there would be no Anti-fortune telling bill. The bill rode too closely to the line of infringing upon religious liberties. Reading through the transcripts from the House Hearings, I think Houdini missed his calling as a lawyer! 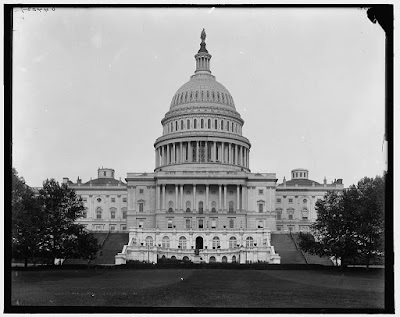 The Government Printing Office published a booklet entitled, FORTUNE TELLING Hearings Before the Subcommittee On Judiciary On The Committee Of The District of Columbia House of Representatives 69th Congress First Session H.R. 8989. The last word that appears in the official transcript from the House of Representatives published by the Government Printing Office........the final word.........HOUDINI.